Rajasthan Royals 5-183 (Brad Hodge 46*, Stuart Binny 38, Lonwabo Tsotsobe 2-26) beat Lions 9-153 (Alviro Petersen 40, Hardus Viljoen 24, Pravin Tambe 4-15, James Faulkner 2-22) by 30 runs. The hosts amassed 183 with five wickets intact at the end of the stipulated 20 overs and Lions managed 153 for the loss of nine wickets. Pravin Tambe (Rajasthan Royals) was announced ‘Player of the match’ for his deadly bowling spell of 4-15. The 9th match of the Champions League Twenty20 was played on Wednesday, September 25, 2013, at Sawai Mansingh Stadium, Jaipur. Earlier, Alviro Petersen, the captain of Lions, won the toss and invited the rival team to bat first. 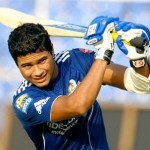 Rajasthan Royals went down by one wicket at 21 as Sanju Samson and his skipper Rahul Dravid tried to sail the boat. The first hit 2 fours and was dropped at 10 in the fifth over but was gone in the next one at 12. Shane Watson came in next, added 2 boundaries in the following overs and Dravid got his fifth four until the end of the 9th over. The latter became the next victim at 67 after scoring 31 and was replaced by Stuart Binny. Watson dispatched 1 six and 2 fours in the 13th one and was caught by Jean Symes off Lonwabo Tsotsobe for 33 as the score touched 110. Brad Hodge got together with Binny who was exploiting the conditions nicely at the other end. Binny added 13 runs in the 16th over with 1 six and 1 four whereas the first got 2 fours in the next one. Stuart Binny was clean bowled by Dwaine Pretorius for 38 off 20 balls with 1 six and 5 fours as the score touched 145 in 16.6 overs. Brad Hodge punished Sohail Tanvir for 20 runs including 2 lofty sixes and even fours and lifted his team up. He remained unbeaten for 46 off 23 mere deliveries with 2 sixes and 6 fours as Rajasthan Royals hammered 183 after losing five wickets in 20 overs. Lonwabo Tsotsobe and Dwaine Pretorius were the top wicket takers with two each whereas Sohail Tanvir got one. Rassie van der Dussen along with Quinton de Kock started the chase in a positive manner as the latter hit 1 six and 2 fours in the first three overs. Quinton de Kock lost his wicket at 25 at his personal score of 18 and his partner departed 11 runs later for 14. Lions were reeling at 3-36 in 4.6 overs when Hardus Viljoen and Alviro Petersen put their heads down to consolidate the innings. The first was dropped at one, he responded with a six instantly and sent another ball flying over the rope in the 9th over. Petersen tasted his first four on the 12th ball he faced and the score crept to 89 in 11.3 overs when the stumps of Hardus Viljoen were dislodged by Pravin Tambe for 24. The middle order batting of the Lions crumbled as their sixth wicket went down at 101 in 13.1 overs. Thami Tsolekile joined in next with Petersen who got a life at 33 and he ultimately hit 2 fours. Alviro Petersen became the fourth victim of Tambe for 40 off 28 with 4 fours as his team still required 64 runs to win the game in 29 deliveries. Tsolekile scored 21 and Pretorius contributed 19 as Lions reached 9-153 after the last ball of the 20th over was bowled. Pravin Tambe was the star performer with the ball and grabbed four wickets for just 15 runs. Vikramjeet Malik and James Faulkner shared two each whereas Shane Watson held one wicket. Rajasthan Royals clinched the game against Lions with a reasonable margin of 30 runs and secured four points.